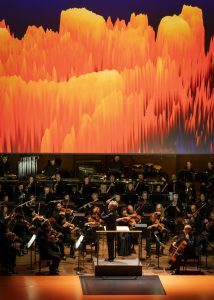 The three pieces on the June 8 concert were New York premieres in whole or part, and conductor Esa-Pekka Salonen composed two of them. 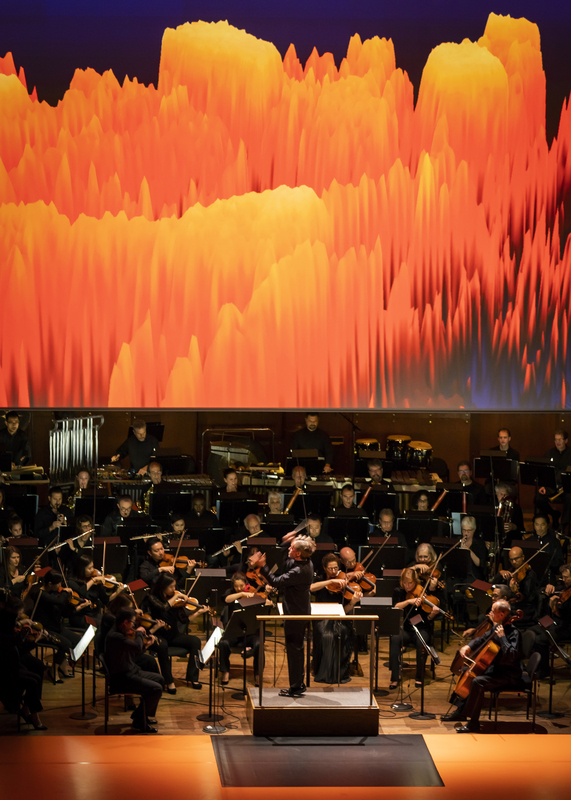 Foreign Bodies opened on a full stage and above it a giant screen, the canvas for live-feed images of colorful filaments, pick-up sticks, morphing boxes and flaming orange peaks. The orange above seemed to speak to the bold orange proscenium extension, so far unused. Later in the concert, it would be the setting for an awesome dance. 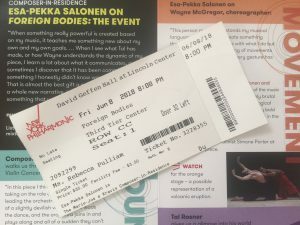 A Foreign Bodies mixtape from the NYPhil offers the entire composition as three separate files on Spotify. The screen had vanished along with about 1/3 of the orchestra when young soloist Pekka Kuusisto entered. Kuusisto gently combined his instrument with his whistling to begin the Violin Concerto by Daníel Bjarnason. The music shifted like weather, stirring the space, becoming gauzy then gathering weight. This piece was my favorite. Until what came next. 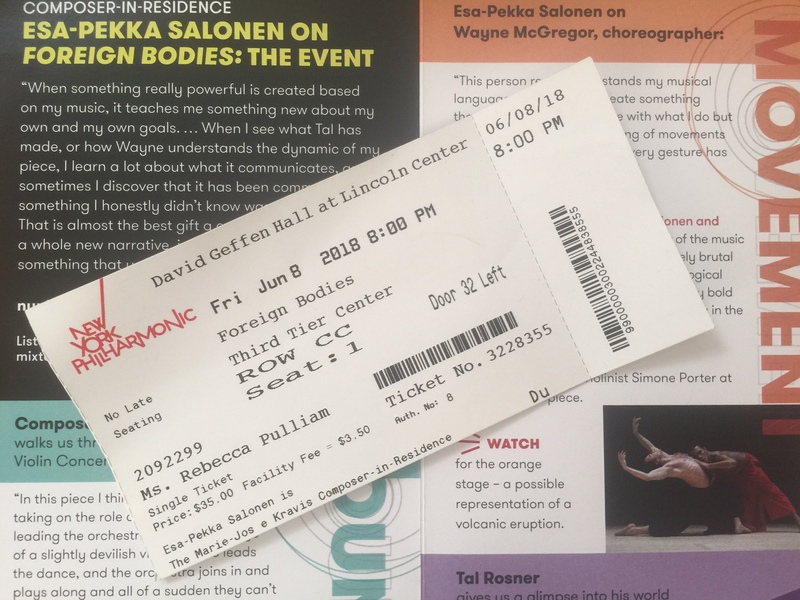 “Watch for the orange stage,” says the Foreign Bodies brochure handed out at the door, “a possible representation of a volcanic eruption.” Two Boston Ballet dancers on the bright colored strip at the stage lip and opened “Obsidian Tear,” choreography by Wayne McGregor to music by Salonen. A single violinist in a First Tier box played the first movement, Lachen verlernt (Laughing Unlearnt), energetically. When the music segued into Nyx for orchestra, half of dozen more male dancers appeared and the music grew massive with a wide trombone section that I loved. Very physical, this music! and the dance is powerful and athletic. It ranges from violent to tender with turns and leaps that in a romantic context would seem like pure grace. David Geffen Hall can seem blank and boxy, but the colors and lighting transformed it for me. I sat in a great seat, nicely priced.